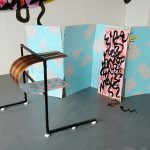 White Wizard is excited to present new works by Frances Disley in our second exhibition – Sssss. 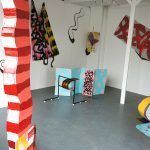 Disley works with a range of materials to create eye-popping sculptures that mix the fluidity of digital imagery with other materials of flux such as paint, tape, wax and fabric. The mobility of these works in the gallery means they become actors in a show to which we might, or might not, be invited. As we move around them it is not clear if they need us to function, or if we are simply in the way, cluttering their dynamic. 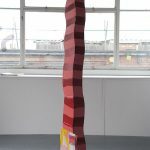 It is telling that Disley uses Jpgs of her sculptural work in the sculptures themselves. 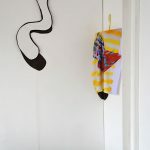 This ‘looping inwards’ gives the sculptures a sense of being self-reflexive, like us, they contain images of themselves. 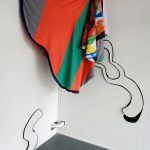 The digital image of the work slides into the camera, slides across the web, is printed onto fabric, which then makes it way through the post back to Disley, who drapes it across another work. This draws our attention to the agility of materials, how they circulate through space and we become ‘nodes’ through which they pass. The space through which they circulate is active, arguably more active than we are as mere consumers, or ‘end users’. All the excitement lies in the way things move, break apart and come back together. Frances Disley is based in Liverpool and is also co-director of MODEL. 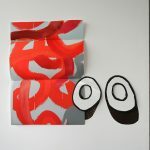 She studied at the Royal College of Art. 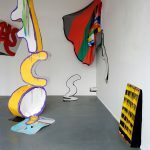 Recent exhibitions include Exchange Rates with Patte Loper at Schema Projects, New York, and solo shows at Paper Gallery in Manchester, and Graphikwerkshdadt, Cologne. 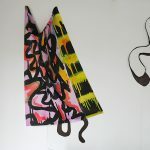 She currently has a solo show, Metamorphosis, at The Grosvenor Museum, Chester, open until the 19th of July.